Going shopping in Barcelona is a real experience. 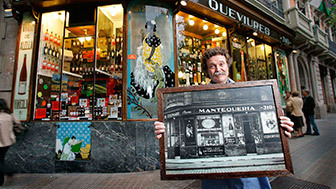 The city conserves interesting, historical shops of all kinds which offer really high-quality products: there is nothing you cannot find in Barcelona. The historical establishments coexist with big fashion labels that can usually be found on the avenues of any cosmopolitan city, and Barcelona is certainly one of them: Passeig de Gràcia, Rambla de Catalunya and the upper part of Avinguda Diagonal are home to the most exclusive international brands. In the city's ten districts there are a total of 32,000 shops, in addition to the markets and shopping centres. Fashion designers with their own labels account for a sizeable number of smaller establishments that proliferate in neighbourhoods like the Born and the Ribera, the Gòtic and Gràcia. Elegance and good taste are the trademarks of local commerce: this can be seen in the products on sale and in the originality of the establishments, many of which are located in old, completely renovated buildings. These shops add beauty and style to Barcelona's idiosyncrasy. Bookshops, establishments selling the most sybaritic food products, antique shops, curiosities, designer products, art galleries, textiles and shoe shops, shops specialising in everything imaginable and some things that are not, including wax products, board games, cutlery, fishing accessories, rope-soled shoes and sheet music. All of this and more is to be found in Barcelona's retail network, which retains the popular character of expert shopkeepers while also incorporating the more cosmopolitan, multilingual perspective of large chain stores. Going for a stroll, looking, smelling, choosing, tasting, buying... or not. Going shopping in Barcelona can be a real sensory experience. Barcelona has over 30,000 shops and they are distributed throughout the city in various shopping hubs, some of which are in pedestrian areas. In the upper part of Barcelona, around Avinguda Diagonal, between Plaça de la Reina Maria Cristina and the streets adjacent to Plaça de Francesc Macià, there is an important area for businesses and shops, particularly fashion boutiques. The area known as the Golden Square, a set of city blocks in the Eixample centred around Passeig de Gràcia, contains some of the city's most valuable Modernista buildings and it is home to the most exclusive and the most popular international fashion labels. Prada, Burberry, Marc Jacobs and Chanel stand shoulder to shoulder with big clothing chain stores such as Zara, Mango and H&M. This is also the place to find the shops of some of the most renowned Spanish designers, including Antonio Miró, Totón Comella (TCN) and Purificación García. In the old quarter there are various shopping streets that are home to the most popular fashion labels. Carrer Pelai, Avinguda del Portal del Àngel and the streets around it are a fantastic place to go shopping. in the Gòtic, Born and Ribera neighbourhoods there are lots of select establishments covering a wide range of sectors: food, fashion, shoes, jewellery, art, etc. There are shops in every Barcelona neighbourhood and there is a good selection of shops around every city market, further proof that Barcelona is the very definition of a commercial city. Barcelona has as many shopping hubs as it has districts. This is the city's retail model: concentrated and varied. 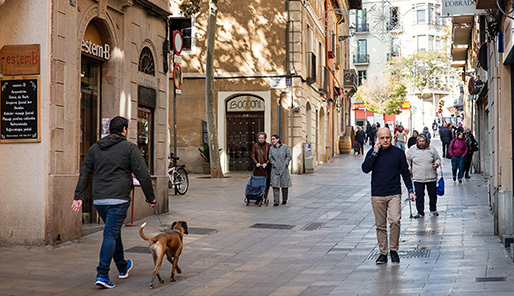 There is a dynamic, vibrant retail trade in every Barcelona neighbourhood, which means people can shop comfortably, without crowding, and locally, helping to foster local commerce. This is the biggest department store chain in Spain, and there are several branches in Barcelona: in Plaça de Catalunya, Portal de l’Àngel, two more on Diagonal and one right next to the Meridiana. They sell everything: sports goods, fashion, electronics, household goods, leisure and culture goods, and there is also a food supermarket. This small shopping centre in Plaça de Catalunya has various shops and cafes. There is a wide range of beauty, fashion and accessory shops, as well as a FNAC store, where you can buy books, music, films and all kinds of electronic goods. Located on Avinguda Diagonal, between the 22@ district and the neighbourhood of Poblenou, this large shopping centre consists of three buildings. There are shops selling fashion articles, toys, leisure goods, food and jewellery, and there are a number of restaurants. There is also a children's play centre and various cinema screens. Located in an imposing building on Avinguda Diagonal, in the Les Corts neighbourhood, the Illa Diagonal was the first shopping centre to open in the city, in 1993. There are a wide range of goods on sale: national and international fashion labels, home decorations, food, restaurants and an interesting fresh-produce market in the basement. This shopping centre is located on the seafront, just opposite the Rambla. There are fashion, decoration, jewellery and electronics shops, among others, as well as various bars and restaurants offering food from all over the world. The views from its terraces are unbeatable. And nearby, you have the Aquarium and the Maritime Museum. It has three floors that house all kinds of retail establishments: a supermarket, plus shops selling electronics, fashion, household decorations, toys and other products. It is located in the middle of the Fòrum area. It also boasts a multiscreen cinema and a variety of restaurants. The centre, which has natural lighting, offers a smartphone app highlighting discounts and promotions. La Maquinista is a big shopping centre with streets, avenues, small squares and benches for sitting outside. It sells absolutely everything. It also has health and beauty services, car-rental companies and, of course, a wide range of bars and restaurants. Its leisure facilities are rounded off by a small casino and a multiscreen cinema. Arenas de Barcelona is a former bullring located in Plaça d’Espanya and it is synonymous with avant-garde. When it was renovated, the building's circular facade was conserved and its interior was remodelled. It has dozens of shops, multiscreen cinemas with screens for 3D films and a rooftop terrace offering spectacular views of the city. The OMIC is a municipal service that advises consumers and service users on how to defend their interests. It offers information prior to purchasing or contracting services and it is also responsible for receiving all complaints and claims related to consumer affairs. The service is free of charge and available to everyone. 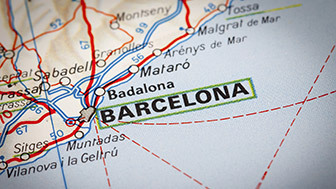 Reception, administration and resolution of complaints and claims, both for Barcelona residents and for those people with a claim against an establishment located in the city. Mediation between the parties concerned in order to resolve conflicts. Information campaigns aimed at users.